A Champaign local, Madelyn Gunn is thrilled to be working in her home community at Class Act. She has volunteered at Class Act as an assistant music director with Kat Downs and Jaclyn Loewenstein for their productions of The Grunch and The Most Epic Birthday Party Ever, and is excited to begin this new chapter as a private voice teacher for young performers. A classically trained singer, Madelyn graduated from the University of Illinois with a Bachelor of Music in 2017. While earning her degree, she worked at the Glimmerglass Festival in Cooperstown and the Ravinia Festival in Chicago. 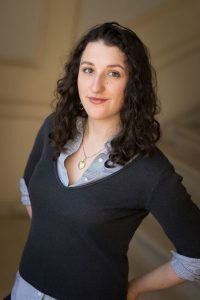 She is also a director, producer, and writer of sung theater and opera in the Champaign-Urbana area, most recently Assistant to the Director for Krannert Center’s ‘Hansel and Gretel’ with Lyric Theatre @ Illinois. As a voice teacher, she specializes in healthy, confident singing in all styles! She is particularly dedicated to the health and maintenance of young singers’ voices as they mature and navigate physical changes during middle and early high school.